I am participating in Another Year of Schnibbles. Please think about joining in this fun project. Click on the button to the right to get more information. Que bonito, adoro las casitas!!!!! 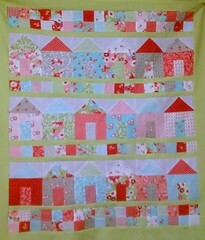 This quilt design reminds me of home, and my mom would love this too. She would be happy to have this. Haha! The colors are soothing to the eyes, and this would fit well in our living room.